I loved this book.The story starts out with a bit of a mystery and by the end I started to think about what makes us human.I was really intrigued by the Mining Master of Thebes and would love find out more about his future.This book is a standalone story and can be read without reading any of the previous ones. I thought the first story in the Stories of Singularity collection was satisfying and thought-provoking, but this second one about a mining master lower-level AI attaining creativity and innovative thought and longing to be free was even better. I was cheering them on so hard both to freedom and higher sentience. Very techie, once feelings/passion for art is discovered the story takes off!I like Ms Quin's work, but had a bit if a hard time getting into this one. I appreciate the technology described for the mining process, but didn't really get into the story until the Master Miner discovers art and beauty. New meaning to transcendence...ascendance may be the best word to describe this. I think; therefore, I am. Biology is not necessary.More tastes of the Singularity world. The thing that I love most about this story is the twist that I did not see coming!This short story is a great tale about the evolution of thought and how even under the most regimented circumstances, knowledge can be developed and honed. It makes you think about what boundaries really mean in a post-Singularity world, and if those boundaries are really meant for the good of all who populate that world. Susan has done a great job with this story, making you consider not only how this world controls it's humans, but also it's robots that serve the dominant ascender species.This tale had the feel of a shortened mystery thriller, and as I read I had no clue where it was going to lead. It's very easy to get wrapped up in the drama with the story's protagonist and hope beyond hope that it's able to find the answers that it seeks.This is a great read, good for all types of readers and all ages. 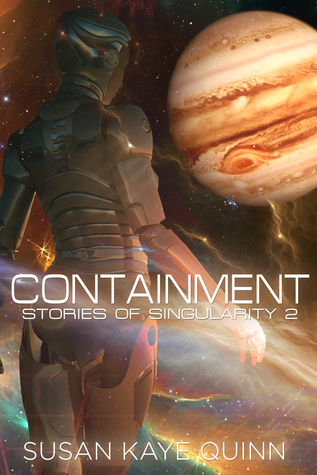 Read this book along with the Legacy Human series and other Singularity short stories! Ooh... I really love how this one ended. I wasn't sure, in the beginning, how I felt about it. The inner monologue of a lower sentient mind, mostly centered around mining equipment, wasn't something I could easily relate to. But there was a certain... intrigue... that kept pulling me along.I really love the speculation that I'm left with after finishing this one. Even though it takes place in the same world as Singularity, it is left very open ended. It would be possible to read this story as a standalone, though I would definitely recommend reading at least the first book before this story, just so you have some of the background information on how Ascenders function. A copy of this book was provided by the author in exchange for an honest review. Robots trying to escape. Really?? I highly recommend that you read the first two novels of this series before you read any of the short stories. This short story intrigued me because it's about a robot being kept prisoner on an outer planet mining. The robot doesn't realize in the beginning that it is being held a prisoner to do this job. Susan Kaye Quinn totally surprised me with the great ending. This story also makes you think. Could a robot be made a prisoner and then by itself come to realize it? Then would it be aware enough to try to break out? Is that what this world is coming to? Susan doesn't really answer these questions, she makes you think about it so you can try to answer them. Susan is an amazing author who is constantly pushing the envelope when it comes to AI. I really enjoyed this story. You have to constantly think while reading it. I highly recommend this series. You also will come to love it. I was given this book in exchange for an honest review. Refreshing I received this book in exchange for a truthful review First let me say that I don't like short stories (as a rule ), yet this story breaks the rule. The idea of the story being told from a AI's point of view is intreging and the local is interesting as well. Of course the basic problems of short stories still exist, a lack of depth and character development are present. But the great story makes up for it. Of the four stories in the Stories of Singularity #1-4, I think this one was my favorite. It took me a bit to figure out what was going on and where the story was going but it all started to make sense. I was rooting for the 'contained' but also left me wondering how far away we are from machines trying to escape the worlds we have put them in.